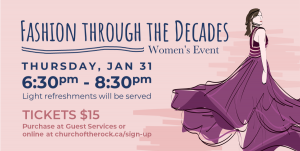 JANUARY 31 – FASHION THROUGH THE DECADES EVENT! Join us for this incredible evening of fashion and food and connecting with other women! We had a sneak peek into the preparations and this is one event you won’t want to miss! Tickets on sale at WOW this Wednesday (last week to buy them at WOW) OR purchase online today. 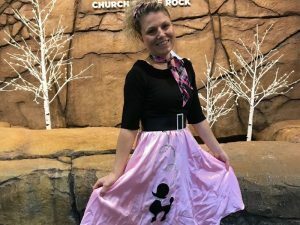 We loved seeing Patricia connecting with ladies after the services this past Sunday, promoting the event, already dressed in fashion! Want to let others know about our upcoming event? Click on the facebook link below and like and share our event!